Principal investigator(s): Jie Gong, Ph.D. Client contact/manager: Caesar Singh, P.E. Figure 34 (top) Aerial of dense infrastructure site 1; and Figure 35 (bottom) 3D reconstructions of site 1. The natural gas distribution system in the United States has 1.2 million miles of mains and about 65 million service lines (as of 2012). This distribution system, which consist of various material types, is subjected to various threats the impact of which differ depending on material, age, location, and operational function of the pipeline. When subjected to multiple threats, this can result in potential damages based on these characteristics. Among other things, natural disasters are rising threats to the integrity of natural gas systems. For example, threats due to natural forces (e.g., landslides, erosion, floods, earthquakes, and other environmental hazards) contributed to about 8.6 percent of these incidents in 2015. There is growing concern in the United States about managing this vast network as weather systems become increasingly aggressive and natural disasters become more frequent. During natural disasters such as hurricane and floods, pipelines can rupture and break due to permanent ground displacement, landslide, and collapsing building structures. This damage can cause significant post-disaster catastrophes such as fires, explosions, personal property loss, and environmental pollution. Timely assessment of pipeline integrity is critical to prevent further post-disaster damages. However, such assessment is currently hampered by a) the lack of data sufficient for quantifying changes in pipeline conditions and their built environment, and b) the lack of data-driven risk models that identify high risk pipe segments after a disaster. 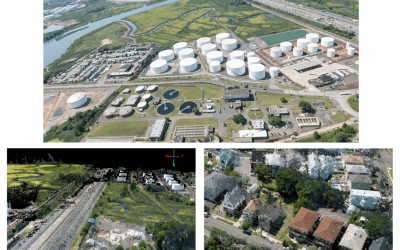 This project—a joint collaboration between Rutgers’ Center for Advanced Infrastructure and Transportation and Gas Technology Institute—explored integration of several remote-sensing technologies and developed dedicated data-processing and decision-support tools that allow pipeline operators to monitor changes in the built environment (structures, terrain, etc.) adjacent to pipelines after a natural disaster and to help them to assess the potential for increased risk of failure. The overall goals of the project were to: 1) provide new remote-sensing capabilities for pipeline performance after natural disasters; 2) develop the ability to detect changes and anomalies in the environment which could indicate threats to pipelines; and 3) develop GIS-based pipeline risk-assessment tools to identify and rank high risks. 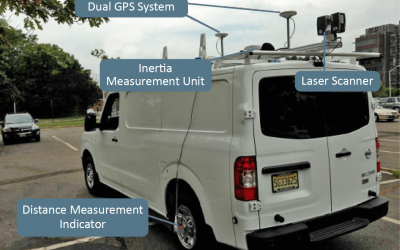 The first stage of the project involved developing, deploying, and validating a mobile mapping platform that integrates commercially available high-precision global navigation, laser scanning, and infrared thermography technologies to provide new remote sensing capabilities for pipeline risk assessment. The second stage investigated fusion of remote sensing data from multiple resources—including mobile mapping system, airborne lidar, and UAV-borne imagery—to provide automated threat detection capabilities. 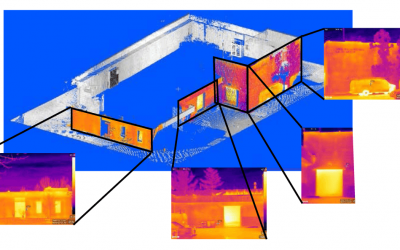 The last stage of the project focused on evaluating and ranking risks based on the characteristics of gas distribution systems and quantified spatially distributed threats.